Tim Bergling (Swedish: ; 8 September 1989 – 20 April 2018), known professionally as Avicii (/əˈviːtʃi/, Swedish: ), was a Swedish musician, DJ, remixer and record producer. At the age of 16, Bergling began posting his remixes on electronic music forums, which led to his first record deal. He rose to prominence in 2011 with his single "Levels". His debut studio album, True (2013), blended electronic music with elements of multiple genres and received generally positive reviews. It peaked in the top ten in more than fifteen countries and topped international dance charts; the lead single, "Wake Me Up", topped most music markets in Europe and reached number four in the United States. For the Buddhist mythological place, see Avīci. Tim Bergling (Swedish: [tɪm ²bærjlɪŋ]; 8 September 1989 – 20 April 2018), known professionally as Avicii (/əˈviːtʃi/, Swedish: [ɑviʃi]), was a Swedish musician, DJ, remixer and record producer. In 2015, Bergling released his second studio album, Stories, and in 2017 he released an EP, Avīci (01). His catalogue also included the singles "I Could Be the One" with Nicky Romero, "You Make Me", "X You", "Hey Brother", "Addicted to You", "The Days", "The Nights", "Waiting for Love", "Without You" and "Lonely Together". Bergling was nominated for a Grammy Award for his work on "Sunshine" with David Guetta in 2012 and "Levels" in 2013. Several music publications credit Bergling as among the DJs who ushered electronic music into Top 40 radio in the early 2010s. Bergling retired from touring in 2016 due to health problems, having suffered stress and poor mental health for several years. 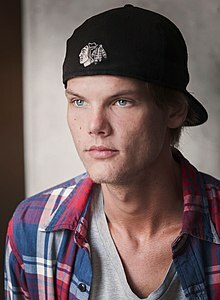 On 20 April 2018, Avicii committed suicide in Muscat, Oman. He was buried on 8 June in his hometown of Stockholm. Tim Bergling was born on 8 September 1989 in Stockholm, Sweden, to Klas Bergling and actress Anki Lidén. He has three siblings, David Bergling, Linda Sterner and Anton Körberg. Inspired by his brother, who was also a DJ, he began making music at the age of 16. In May 2007, Avicii signed on with the Dejfitts Plays label. Bergling was a member of the Laidback Luke Forums, where he refined his craft and, at times, demonstrated his distinct deep house style. By 2009 to 2010, Bergling was a prolific producer and was releasing music incredibly quickly. His remixes during this period were "Sound of Now", "Muja", "Ryu" and "Even". Bergling explained that the name Avicii means "the lowest level of Buddhist hell" (Avīci) and he chose the moniker because his real name was already used upon creating his Myspace page. Then, in 2010, Bergling released the hit song "Seek Bromance", which reached the top 20 in several countries, including Belgium, France, the Netherlands, United Kingdom, and Sweden. He also remixed Nadia Ali's classic single "Rapture" for her album Queen of Clubs Trilogy: Onyx Edition. In October 2010, Bergling signed with the European A&R team with EMI Music Publishing. In 2011, Bergling released "Levels", which launched him into the mainstream. The song was produced by Bergling and contains a vocal sample from the 1962 gospel-inspired "Something's Got a Hold on Me" by Etta James. The same vocal sample was used earlier by Pretty Lights in his 2006 song "Finally Moving". This sample was also used by drum and bass producer Logistics on "Call Me Back" and by Flo Rida in his single "Good Feeling", which was produced by DJ Prak and Cirkut. "Levels" reached the top ten in Austria, Belgium, Bosnia, Croatia, Denmark, Finland, Germany, Greece, Ireland, Italy, the Netherlands, Slovenia and the United Kingdom, whilst topping the charts in Hungary, Norway and Sweden. In 2012, his collaboration track "Sunshine" with David Guetta was nominated for a Grammy award under the category for Best Dance Recording. His track "Fade into Darkness" was sampled by Leona Lewis on her single "Collide". The sampling was not accredited and led to controversy as Bergling attempted to block the single's release. The matter was resolved out of court with representatives stating "that Leona Lewis and Avicii will work together on the forthcoming single of Collide". Bergling was a featured performer on 4 August 2012 at Lollapalooza festival in Chicago's Grant Park. On 12 August 2012, he released "Dancing in My Head" (Avicii's 'Been Cursed' Mix) on Beatport. The track features vocals from Eric Turner. A radio edit of the track, titled "Dancing in My Head" (Tom Hangs Mix) was released on 14 August 2012 on iTunes, and a remix EP was later released on 30 October 2012 featuring remixes from Charlie Bernardo and Michael Woods. On 26 September 2012, Bergling made history as the first DJ to headline the world-famous Radio City Music Hall in New York City. He performed two sold out shows on 26 and 27 September. He was supported by Matt Goldman and Cazzette at the two shows. At his Radio City Music Hall shows, he played a preview of his new track with Mike Posner titled "Stay with You". On 29 December 2012, Bergling premiered many new songs at Lights All Night, Dallas Convention Center, some of which made it on to his first album, True. These unreleased songs included "I'll Be Gone" and "Let It Go". The instrumental of "Let It Go" was mixed with the a capella of "Addicted to You" to become "Addicted to You (Avicii by Avicii)". On the same day, Bergling released "I Could Be the One" with Nicky Romero. After first being debuted at his shows almost a year earlier, the track finally got released via Bergling's record label LE7ELS. The new vocal version was released along with an instrumental version, a radio edit, and remixes from Audrio and Didrick. On 9 January 2013, Bergling launched the Avicii X You project, a partnership with Ericsson designed to create the world's first "crowdsourced" hit song. The project enabled fans to send in basslines, effects, melodies, rhythms and vocals to Bergling as sound files over the Internet. The song features sequences from Kian Sang (melody), Naxsy (bassline), Martin Kupilas (beat), Ваня Хакси (break), Jonathan Madray, Mateusz Kolata, and Christian Westphalen (effects). Bergling acted as executive producer and created the finished song officially titled X You, which was released on 26 February 2013. On 30 January 2013, Bergling released "Three Million" featuring Negin to celebrate three million fans on his Facebook page. In March 2013, Bergling announced and premiered many new tracks from his new album True, which would later be set to be released in September, during his Main Stage set at Ultra Music Festival in Miami. The new tracks were experimental in nature. For example, Bergling brought out a stomping band to play through the new bluegrass-tinged song "Wake Me Up". Many of these new songs received mixed critical reviews after the concert. On 14 June 2013, the world premiere of Bergling's new single, "Wake Me Up", was previewed by Pete Tong on BBC Radio 1, featuring vocals from Aloe Blacc. The song was later released on iTunes and radio on 25 June 2013. It is the first single from Bergling's album True, which was released on 16 September 2013. "Wake Me Up" was number 1 on the Spotify Global Chart and Bergling was at 2 in most streamed artist worldwide. "Wake Me Up" later went on to set a then record of 14 weeks as the number one hit on Billboard's Dance/Electronic Songs list. The Official Charts Company announced on 21 July that "Wake Me Up" had become the UK's fastest selling single of 2013 after overtaking Robin Thicke's "Blurred Lines", having sold 267,000 copies in its first week on sale in the UK. "Wake Me Up" subsequently became a major hit, topping the charts in over 20 countries including Australia, Germany, Ireland, Italy, Sweden, the Netherlands, and New Zealand. On 19 October 2013, the DJ Mag 2013 Top 100 DJs List was announced, with Bergling ranking number 3 on the list. Hardwell became the new World No.1 displacing Armin Van Buuren. On 28 October 2013, Bergling released the single "Hey Brother" with vocals by Dan Tyminski. On 10 November, Bergling won his first award "Best Electronic" at the MTV EMA's. On 24 November 2013 he won the American Music Award for favorite Electronic Dance Music Artist. In December 2013, Bergling released his fourth single off the album, "Addicted to You", which reached number 5 in Australia, with vocals from Audra Mae, who also sings on "Shame on Me" and "Long Road to Hell", both tracks on the album. Bergling also released the single "Lay Me Down", featuring vocals from Adam Lambert and guitar from Nile Rodgers. On 29 December 2013, Bergling debuted his new track "Dreaming of Me", featuring vocals from Audra Mae, via episode 19 of his LE7ELS podcast. It is unknown whether it will be released in the future. In July 2014, Bergling released his single "Lay Me Down". He also produced and collaborated with Chris Martin from Coldplay, co-writing and co-producing the track "A Sky Full of Stars" from the band's sixth studio album Ghost Stories, released on 19 May 2014. He also played and recorded the piano parts on the track. "A Sky Full of Stars" was released on 3 May as the second single from Ghost Stories. "Lovers on the Sun", a track Bergling co-produced with David Guetta, was released on 30 June 2014. Avicii also worked with Wyclef Jean on a single titled "Divine Sorrow" for the Hatian singer's upcoming album Clefication. During his tour for True, he also performed his upcoming single "No Pleasing a Woman" with vocals from Billie Joe Armstrong of the American rock band Green Day. It has a similar instrumental to "Wake Me Up" albeit different chord progressions, along with "No Pleasing a Woman". Bergling also performed other upcoming songs like "In Love with Your Ghost" with Daniel "Danne" Adams-Ray, "Love to Fall" with Tom Odell and "Million Miles" with LP, which is the demo version of "Trouble", a song from Stories with vocals from Wayne Hector. "Lose Myself", a collaboration between Bergling and Chinese singer Wang Leehom, was released on 1 September 2014. On 8 September 2014, his 25th birthday, Bergling decided to cancel all of his remaining performances of 2014 due to health concerns. The following day, he announced through Denim & Supply that he would release his new single "The Days" later in 2014; a video was also featured with a preview of the track. "The Days" is a collaboration between Bergling and Robbie Williams, and was released on 3 October 2014 via PRMD. On 16 September 2014, it was announced through EA Sports that Bergling was debuting a new track called "The Nights" exclusively on FIFA 15. On 17 November 2014, it was officially announced that the track is to be released as a part of an EP together with "The Days". On 17 November 2014, Wyclef Jean released a track titled "Divine Sorrow" featuring Avicii. On 2 March 2015, Bergling performed live at Australia's Future Music Festival his upcoming single "Heaven", a collaboration with Coldplay frontman Chris Martin on vocals. The vocals were later resung by singer Simon Aldred from Cherry Ghost; Chris Martin will receive writing credits on "Heaven". A lot of songs were leaked into the internet via Bergling's UMF set 2015. These songs include "Heaven", "Waiting For Love," and some of his ID's "For A Better Day", "City Lights", "Can't Catch Me", "True Believer", "What Would I Change It To", "Can't Love You Again" (previously leaked on the internet under the name "Don't Call") and "Attack". On 6 May 2015, Bergling released his rework of Nina Simone's version of "Feeling Good", composed in 1964 by the English songwriters Anthony Newley and Leslie Bricusse. On 8 May 2015, Bergling previewed his song "I'll Be Gone" via episode 422 of Tiësto's Club Life Podcast which has a very similar instrumental to Liar Liar (Avicii by Avicii) albeit different vocals and chord progressions. It was leaked into the internet between 2013–2014 via the name "Stars" and is yet to be released. It also shares a similar drop to one of Bergling's ID's "Black and Blue". On 22 May 2015, Bergling premiered another single from Stories, "Waiting for Love". The track was co-produced by fellow DJ and producer Martin Garrix, and featured vocals from Simon Aldred of Cherry Ghost. On 25 May 2015, Bergling previewed three old tracks on episode 36 of his LE7ELS podcast: "Tracks of My Tears", "Sorry Mr. Atari" and "Time to Get lll", all of which are songs that Bergling had made years ago. "Tracks of My Tears" is the original version of Bergling's "All You Need is Love". On 27 May 2015, it was confirmed by a Swedish newspaper through an interview with Bergling that his sophomore album Stories would be released in late 2015. On 3 July 2015, Bergling previewed two tracks from his album Stories on episode 37 of his LE7ELS podcast: "Broken Arrows" featuring Zac Brown Band and "Can’t Catch Me" featuring Wyclef Jean and Matisyahu. He also played a full version of his track "Heaven" and said that he was doing another track with Chris Martin on vocals called "True Believer". Later, Bergling said that he is also singing on that track. On 18 July 2015, it was announced by Bergling that he had finally finished production on Stories after 2 years of work. A couple of weeks later, on 4 August 2015, it was announced that the final singles before the release of Stories would be "For a Better Day" featuring American singer Alex Ebert and "Pure Grinding" featuring vocals from Kristoffer Fogelmark and Earl St. Clair. On 27 August, Bergling released a teaser video on Instagram with the song "Pure Grinding" playing. The tracks "For a Better Day" and "Pure Grinding" were released the following day through Spotify and iTunes. On 26 September, Bergling announced "Stories – Megamix" on Spotify. Stories was released on 2 October 2015 alongside 3 promotional singles: "Broken Arrows" with Zac Brown, "Ten More Days" with Zak Abel and "Gonna Love Ya" with Sandro Cavazza. On 15 January 2016, Bergling released his remix of Morten's "Beautiful Heartbeat". Coca-Cola had partnered with Bergling for a global campaign anthem "Taste the Feeling" featuring Conrad Sewell. The song was released on 19 January. On 25 January, Bergling teamed up again with Coldplay to co-produce the band's single "Hymn for the Weekend", which was released as the second single from their album A Head Full of Dreams. In 2016, according to a report by Inc. magazine, Avicii was the 6th fastest-growing company in Europe, with a revenue of €7.7 million in 2014. On 19 March 2016, Bergling performed live at Ultra Music Festival and premiered new IDs such as "Without You (feat. Sandro Cavazza)", "We Burn (Faster Than Light)", and a collaboration with Australian pop star Sia (which he first played in Dubai). On 29 March, Bergling announced on Facebook that he would be retiring from performing live and touring in 2016. On 7 April 2016, Bergling announced that he was working on a third studio album. On 3 June 2016, Bergling released his collaboration with Otto Knows titled "Back Where I Belong". It's the second collaboration with the two producers after "Itrack", back in 2011. On 15 July 2016, Bergling released a remix of his own song, "Feeling Good". The remix was titled "Feeling Good (Avicii by Avicii)". This track was only released on Bergling's official YouTube channel. On 1 August, it appears to have been pulled with the YouTube video being made private. On 28 August 2016, Bergling performed his final live performance in Ibiza, before retiring from touring citing health concerns. His initial announcement was made on his website in April. On 22 December 2016, a representative of Avicii Music AB had announced that Avicii had parted ways with long-time manager Ash Pournouri and At Night Management along with Ash's record label PRMD. The representative also announced that Avicii had signed on to Universal Music Sweden and was expected to release his third studio album in 2017. In June 2017, British singer Rita Ora debuted a semi-acoustic version of "Lonely Together" at a private event at Annabel's in London. "Lonely Together" was later the second single from Avīci (01). From 13 July to 2 August, Avicii shared one-minute snippets on Instagram, captioned "New music coming very very (very) soon! ", with track titles as hashtags. Avicii uploaded teasers of each track from the EP online upon release. On 10 August 2017, Bergling released the six-track EP Avīci (01). Avicii said of the release: "I'm really excited to be back with music once again. It has been a long time since I released anything and a long time since I was this excited over new music! My focus on this first EP of the album was to get a mix of new and old songs: some that fans have been asking about and waiting for mixed with brand new songs that they haven't heard before!" In an interview with Pete Tong on BBC Radio 1, Bergling stated that the EP is one of three parts of his third studio album. On 11 September 2017, Avicii announced a documentary entitled Avicii: True Stories. The documentary chronicles the artist's retirement from touring and features interviews from his colleagues David Guetta, Tiësto, Wyclef Jean, Nile Rodgers and Chris Martin of Coldplay. On February 10, 2018, Avicii released "Ghost", a collaboration with Swedish singer-songwriter Daniel Adams-Ray, who was credited as HUMAN. The song, which was leaked on the internet in 2014/2015 under the title "(I'm Still) In Love With Your Ghost", marks the second collaboration with the 2 Swedes following "Somewhere In Stockholm" from Avicii's album "Stories". Following Avicii's death, news outlets reported that at the time of his death, he had over 200 unreleased songs, some finished and others still in development. It was further stated that he had produced some of the best songs in his career before his passing. Avicii's management have yet to announce a release for his unreleased music. However, in August 2018, producer Carl Falk, who co-produced Bergling's "Stories" album in 2015 and his latest EP, stated that he's putting the finishing touches on the Chris Martin collaboration "Heaven" (originally written during the "Stories" sessions) and that it might be posthumously released in a few months along with the third album. Daft Punk (left) and Swedish House Mafia (right) were both influences on Avicii's sound. Bergling's influences included Daft Punk, Swedish House Mafia, and Eric Prydz. He described his introduction to electronic music as "listening to a lot of Daft Punk, way before I knew what house music was". Bergling's early work was deep house and progressive house, usually based on a four-chord structure, sub-bass and a simple synth melody. His debut studio album True featured a blending of music genres, including folktronica. While making the album, Bergling wanted to fuse the electronic music genre with soul, funk, blues, folk and country, as he felt that EDM had become too focused on "dirty drops". Its first single, "Wake Me Up", is a folk music crossover, which, as noted by a The Observer writer, "tapped into the market potential of mixing EDM and country, a template many artists have since recreated". A Variety editor commented that Bergling's "distinct sound" was comprised by "soaring synths and keening melodies". Musicians such as Kygo, Skrillex, Diplo, Martin Garrix and Cheat Codes have cited him as a source of inspiration. After achieving widespread commercial success, Bergling began working with his manager and executive producer Ash Pournouri to start House for Hunger in 2011, a charity dedicated to alleviating global hunger. The pair wanted to showcase the giving spirit fostered by the house music community. Bergling explained, "You have to give something back. I am so fortunate to be in the position where I can actually do that. I feel lucky every day when I wake up and am able to do what I love and make a living." In addition to donating $1 million to Feeding America, a charity founded by John van Hengel, House for Hunger has helped fund the efforts of The Feed Foundation, started by Laura Bush, allowing it to distribute over 2 million school meals throughout Africa. He also supported campaigns against human trafficking and gang violence when he directed the videos for his tracks "For a Better Day" and "Pure Grinding". In January 2012, Bergling was hospitalized for 11 days in New York City with acute pancreatitis caused by excessive alcohol use. In 2014, Bergling underwent surgery and had both his appendix and gallbladder removed. In 2016, Bergling's health deteriorated and he retired from performing live. In the 2017 documentary Avicii: True Stories, Bergling spoke about his physical and mental health struggles. The documentary depicts the pressure from his management to continue performing live in spite of his objections. "Our beloved Tim was a seeker, a fragile artistic soul searching for answers to existential questions. An over-achieving perfectionist who travelled and worked hard at a pace that led to extreme stress. When he stopped touring, he wanted to find a balance in life to be able to be happy and to do what he loved most – music. He could now not go on any longer. On 1 May, TMZ reported that the cause of death was a suicide due to self-inflicted injuries with a broken wine bottle, with Avicii eventually dying of blood loss. On 22 May, Bergling's family announced plans for a private funeral with "the people who were closest to him". Bergling was buried on 8 June at the Skogskyrkogården cemetery in Stockholm. On 20 May, American DJ duo, The Chainsmokers, and American singer-songwriter, Halsey, paid tribute to Avicii at the 2018 Billboard Music Awards before presenting the winner of the Top Hot 100 Song. The Chainsmokers’ Drew Taggart said, "His passing was a great loss for the music world and for us. He was an artist who inspired so many in so many ways, and simply put, he meant so much to us and everyone in the EDM community." Halsey then delivered an emotional discussion about mental health and emphasized the need for people to love and support each other. On 27 May, at BBC's Biggest Weekend, Rita Ora, Avicii's most recent collaborator, paid tribute to the late DJ, describing him as "a really good friend" who "changed [her] life". A similar tribute was also paid by Ora during King's Day and Capital's Summertime Ball. On April 22, 2018, American band OneRepublic paid tribute to Avicii by performing his hit single "Wake Me Up" during their show in Mumbai. On the same day, Tiesto played a medley of Avicii's songs at EDC Las Vegas. Aloe Blacc joined him on stage to perform "Wake Me Up". The 2018 edition of Tomorrowland saw several tributes to Avicii from Axwell Λ Ingrosso, Don Diablo, Nicky Romero, Dimitri Vegas & Like Mike, Zedd and Kygo, the latter mentioning that Avicii was his big influence in EDM. All DJs honoured his memory by playing his music in their sets during the festival which Michael Thivaios (Like Mike) described as Avicii's home. Thivaios continued calling Avicii "one of [his] best friends" and "a great inspiration". On July 27, Russian DJ/Producer Arty released a song called "Tim" as a tribute to Avicii. "I made a track for my friend," he stated. "I just want to honor his memory. I want to do something right, and in my opinion it's the right thing to do." In addition to the live tributes, many other artists including Eric Prydz, Imagine Dragons, Calvin Harris, and Zedd also paid tribute to Avicii on Twitter. On 16 November, Avicii's family organised a public memorial service at the Hedvig Eleonora Church in Stockholm. The service saw a huge fan turn-out, with hundreds of fans filling the church to mourn pay their respects. The service featured an orchestral choir which played music linking to events in Avicii's life and ended with a version of his 2013 number one hit "Wake Me Up". One fan described it as a "very moving" service and "a great tribute to Avicii". Avicii was depicted on a Swedish postage stamp issued 15 January 2015 by PostNord Sverige. Avicii was named in the 2016 song "I Took a Pill in Ibiza" by American singer and songwriter Mike Posner. Posner recounts the event when he went to an Avicii show in Ibiza and got a mystery pill from someone, with the starting lyrics "I took a pill in Ibiza / To show Avicii I was cool". The song was made in the week they wrote a song together in Sweden called "Stay with You". ↑ Halperin, Shirley (21 April 2018). "Geffen Records' Neil Jacobson on the Power of Avicii and Plans for Unreleased Music (EXCLUSIVE)". Variety. Retrieved 23 April 2018. ↑ "AVICII: Biography". The DJ List. Retrieved 4 June 2011. 1 2 McIver, Joel (22 April 2018). "Avicii obituary". The Guardian. Retrieved 22 April 2018. ↑ Avicii – True. Australian-charts.com. Retrieved 16 October 2015. ↑ Avicii – True. Danishcharts.com. Retrieved 16 October 2015. ↑ Avicii – True. Swedishcharts.com. Retrieved 16 October 2015. ↑ Avicii – Chart history. Billboard. Retrieved 16 October 2015. 1 2 3 Rishty, David (10 August 2017). "Avicii Breaks Musical Silence With 'Avīci' EP: Listen". Billboard. 1 2 Avicii. "Grammy Awards 2012". Retrieved 23 May 2013. ↑ Gottlieb, Jed (21 April 2018). "Avicii's hits brought electronic dance music to mainstream". Boston Herald. Retrieved 21 April 2018. ↑ "Top DJ Avicii dies at 28". The Straits Times. 21 April 2018. Retrieved 21 April 2018. 1 2 "Aviciis familj i öppet brev: Han orkade inte längre" (in Swedish). SVT Culture. 26 April 2018. Retrieved 26 April 2018. 1 2 "Avicii Bio | Avicii Career". MTV. Retrieved 16 October 2013. ↑ Marikar, Sheila (20 April 2018). "The E.D.M. star Avicii dies too soon". The New Yorker. Retrieved 24 April 2018. ↑ "Laidback Luke Forum: Where Are They Now?". turnupthebass.net. Archived from the original on 19 May 2014. ↑ "The Origins of 10 Iconic Names in Dance Music". EDM.com. 4 February 2016. Archived from the original on 12 June 2016. Retrieved 3 November 2016. ↑ Farella, Dylan (11 August 2013). "Avicii discusses choosing his DJ name, connecting with manager Ash, more on rise to stardom". Dancing Astronaut. Retrieved 3 November 2016. ↑ "Tim Berg – Bromance". ultratop.be. Archived from the original on 8 June 2016. Retrieved 13 June 2016. ↑ Hung, Steffen. "Tim Berg – Seek Bromance". lescharts.com. Archived from the original on 9 August 2016. Retrieved 13 June 2016. ↑ 40, Stichting Nederlandse Top. "Tim Berg – Bromance (Avicii Remix)". Top40.nl. Retrieved 13 June 2016. ↑ "Official Singles Chart Top 100". officialcharts.com. Retrieved 13 June 2016. ↑ Hung, Steffen. "Tim Berg – Seek Bromance". swedishcharts.com. Archived from the original on 24 June 2016. Retrieved 13 June 2016. ↑ "Sony/ATV Extends Co-Publishing Deal with Avicii". Billboard. Retrieved 13 June 2016. ↑ "Avicii's Levels – Discover the Sample Source". WhoSampled. Retrieved 13 June 2016. ↑ "Pretty Lights's Finally Moving – Discover the Sample Source". WhoSampled. Retrieved 13 June 2016. ↑ "Logistics's Call Me Back – Discover the Sample Source". WhoSampled. Retrieved 13 June 2016. ↑ "Avicii Bio, Music, News & Shows". DJZ.com. Archived from the original on 29 March 2013. Retrieved 28 February 2013. ↑ Hung, Steffen. "Avicii – Levels". austriancharts.at. Archived from the original on 24 June 2016. Retrieved 13 June 2016. ↑ "Avicii – Levels". ultratop.be. Archived from the original on 27 September 2016. Retrieved 13 June 2016. ↑ Hung, Steffen. "Avicii – Levels". danishcharts.com. Archived from the original on 8 August 2016. Retrieved 13 June 2016. ↑ "Musiikkituottajat – Tilastot – Suomen virallinen lista – Artistit". ifpi.fi. Retrieved 13 June 2016. ↑ "Die ganze Musik im Internet: Charts, Neuerscheinungen, Tickets, Genres, Genresuche, Genrelexikon, Künstler-Suche, Musik-Suche, Track-Suche, Ticket-Suche – musicline.de". musicline.de. Retrieved 13 June 2016. ↑ "GFK Chart-Track". chart-track.co.uk. Retrieved 13 June 2016. ↑ Hung, Steffen. "Avicii – Levels". italiancharts.com. Archived from the original on 29 June 2016. Retrieved 13 June 2016. ↑ 40, Stichting Nederlandse Top. "Avicii – Levels". Top40.nl. Retrieved 13 June 2016. ↑ "Official Dance Singles Chart Top 40". officialcharts.com. Retrieved 13 June 2016. ↑ lightmedia.hu. "Rádiós Top 40 játszási lista – Hivatalos magyar slágerlisták". zene.slagerlistak.hu. Retrieved 13 June 2016. ↑ Hung, Steffen. "Avicii – Levels". norwegiancharts.com. Archived from the original on 17 June 2016. Retrieved 13 June 2016. ↑ Hung, Steffen. "Avicii – Levels". swedishcharts.com. Retrieved 13 June 2016. ↑ Halliday, Josh (16 August 2011). "Leona Lewis resolves legal dispute with Swedish DJ over new single". The Guardian. Retrieved 12 October 2014. ↑ "Avicii – Last Dance". HYPETRAK. Retrieved 13 June 2016. ↑ "Avicii Releases Ultra Music Fest Remix of Madonna's 'Girl Gone Wild'". PopCrush. Retrieved 13 June 2016. ↑ "Avicii vs. Lenny Kravitz – "Superlove"". thetopsound.com. Retrieved 13 June 2016. ↑ "Avicii – Chart history". Billboard. Retrieved 13 June 2016. ↑ "Eric Turner New Releases: Dancing in My Head (Avicii's Been Cursed Remix) [Eric Turner vs. Avicii]". beatport.com. Retrieved 13 June 2016. ↑ Montgomery, James (27 September 2012). "Avicii Makes History – Loudly – With Radio City Show". 1 2 Aswad, Jem (20 April 2018). "Avicii Dies at 28". Variety. Retrieved 20 April 2018. ↑ "Avicii @ Lights All Night, Dallas Convention Center, United States 2012-12-29 Tracklist / Playlist". 1001tracklists.com. Retrieved 12 November 2015. ↑ "Avicii vs Nicky Romero: 'I Could Be the One' review". Digital Spy. 13 February 2013. Retrieved 13 June 2016. ↑ "Sets Tone for New Music Trends in Project with Avicii". Ericsson. Retrieved 8 March 2017. ↑ "Avicii's 'X You' track unleashes the power of networked, social entertainment". Ericsson.com. Retrieved 13 June 2016. ↑ "Avicii hits 3 million fans on Facebook, gives away 'Three Million (Your Love is Amazing)'". Dancing Astronaut. 30 January 2013. Retrieved 13 June 2016. ↑ "Avicii: My Grammy Ritual". Billboard. Retrieved 13 June 2016. ↑ "Home | Future Music". Futureentertainment.com.au. Archived from the original on 1 September 2013. Retrieved 16 October 2013. ↑ "RA: Avicii tour dates for 2013". Resident Advisor. Retrieved 13 June 2016. ↑ Doyle, Patrick (29 August 2014). "Avicii's Rave New World". Rolling Stone. ↑ Farella, Dylan (27 March 2013). "Avicii rolls the dice at Ultra 2013; too advanced for dance". Dancing Astronaut. ↑ "AVICII – PROMO MIX 2013 – INCLUDING NEW ALBUM TRACKS". SoundCloud. Retrieved 20 June 2015. ↑ "ABBA's Benny, Björn and Avicii to write 'Eurovision anthem'". EBU. Retrieved 15 April 2013. ↑ "Avicii to premiere 'Wake Me Up' this Friday on Pete Tong's BBC Radio 1 show". Dancing Astronaut. 11 June 2013. Retrieved 13 June 2016. ↑ Summers, Nick (27 February 2014). "Avicii's Wake Me Up is the Most-Played Spotify Track of All Time". The Next Web. Retrieved 13 June 2016. ↑ Kreisler, Lauren (21 July 2013). "Avicii scores fastest selling single of 2013 so far with Wake Me Up". Official Charts. Official Charts Company. ↑ "Avicii extends Aussie singles chart lead". Digital Spy. 12 August 2013. Retrieved 13 June 2016. ↑ "Felix Jaehn lands Germany's music hit of the summer". DW.COM. 11 August 2015. Retrieved 13 June 2016. ↑ "Avicii – Wake Me Up". Swedishcharts.com. Archived from the original on 16 July 2016. Retrieved 12 June 2016. ↑ "Avicii – Wake Me Up!". Top40.nl. Retrieved 13 June 2016. ↑ "Avicii – Wake Me Up!". New Zealand Charts. Archived from the original on 12 August 2016. Retrieved 12 June 2016. ↑ Farella, Dylan (10 November 2012). "7 reasons why Avicii was voted top 3 in DJ Mag's 2012 ranking". Dancing Astronaut. ↑ Houston, Roger (11 November 2013). "Avicii Wins Best Electronic Award at MTV EMA". exqlusiv.com. Archived from the original on 2 December 2013. ↑ "AMA Winners List 2013". Hollywoodlife.com. ↑ "Avicii – Addicted To You". ARIA Charts. Retrieved 21 April 2018. ↑ "Listen: Audra Mae featured on Avicii's new album "True," out today". NewsOK.com. 17 September 2013. Retrieved 13 June 2016. ↑ "Avicii Radio Podcast DJ Mix: Levels – Episode 019 + Tracklist". Dash Berlin. Archived from the original on 20 June 2015. Retrieved 20 June 2015. ↑ Coleman, Miriam (8 March 2014). "Madonna Announces Collaboration With Avicii". Rolling Stone. ↑ Lipshutz, Jason (28 March 2014). "Avicii replaced by Deadmau5 at Ultra Music Festival 2014". Billboard. ↑ "Daily Wrap-Up: 4–2–14". NoisePorn. Retrieved 2 April 2014. ↑ "LISTEN: Adam Lambert Debuts New Dance Song!". The Huffington Post. 13 September 2013. Retrieved 13 June 2016. ↑ Stern, Bradley (30 June 2014). "David Guetta And Avicii Team Up For 'Lovers on the Sun (Feat. Sam Martin)': Listen". idolator.com. ↑ Ramirez, Erika (28 August 2014). "Exclusive: Wyclef Jean Announces 'Clefication' Album & Avicii-Assisted Single". Billboard. Retrieved 31 August 2014. ↑ Edwards, Gavin (31 July 2014). "Avicii Calls in Rock & Roll Collaborators for Follow-Up to 'True'". Rolling Stone (1214). Retrieved 31 August 2014. ↑ "EXCLUSIVE: Avicii & Billie Joe Armstrong – No Pleasing A Woman (PREVIEW)". 28 July 2014. Retrieved 10 March 2015. ↑ "Avicii – The Nights (Audio)". 17 November 2014. Retrieved 10 March 2015 – via YouTube. ↑ "Coca-Cola Invites The World To "Share The Sound of an AIDS Free Generation" And Support (RED)". The Coca-Cola Company. Retrieved 10 March 2015. ↑ "AVICII – LEVELS PODCAST". Podcast Chart. Archived from the original on 25 May 2015. Retrieved 20 June 2015. ↑ "Avicii reworks Nina Simone classic 'Feeling Good' and it's big". Digital Spy. Retrieved 20 June 2015. ↑ Maybir, Lawrence. "Avicii Premieres New Track On Tiesto's Club Life Podcast". Your EDM. Retrieved 20 June 2015. ↑ "Avicii's new track 'I'll Be Gone' isn't so new". Dancing Astronaut. Retrieved 20 June 2015. ↑ "Avicii, Martin Garrix And John Legend Team Up For New Song 'Waiting For Love'". Capital XTRA. Retrieved 24 April 2018. ↑ "iTunes – Podcasts – AVICII – LEVELS PODCAST by Avicii". iTunes. Retrieved 20 June 2015. ↑ "Avicii håller hov i Las Vegas". Göteborgs-Posten. Retrieved 20 June 2015. ↑ "Avicii Drops Two Unreleased Tracks From New Album". Wegotthiscovered.com. Retrieved 3 July 2015. ↑ "On which song on Stories did Avicii sing?". Quora. Retrieved 8 March 2017. ↑ Tim Bergling on Twitter: "Finally finished my album! After two years of hard work it is finally done! Feels so good!. Twitter.com (18 July 2015). Retrieved 16 October 2015. ↑ Avicii Announces Two New Singles, ‘For A Better Day,’ ‘Pure Grinding’. Radio.com (24 August 2015). Retrieved 16 October 2015. ↑ "Avicii's 'Stories' album mega-mix leaks ahead of album release". Dancing Astronaut. 26 September 2015. Retrieved 13 June 2016. ↑ "Stories by Avicii on iTunes". iTunes. Retrieved 29 April 2016. ↑ "Beautiful Heartbeat (feat. Frida Sundemo) (Avicii Remix) by MORTEN, Frida Sundemo, Avicii". beatport.com. Retrieved 13 June 2016. ↑ "Rising Australian Pop Singer Conrad Sewell, With Assist From Avicii, Fronts Coca-Cola's New Campaign". Billboard. Retrieved 13 June 2016. ↑ "Listen To This Epic Three Way Collab Between Coldplay, Beyoncé, and Avicii". Your EDM. 3 March 2017. Retrieved 8 March 2017. ↑ "Avicii Named 6th Fastest-Growing Company In Europe". Your EDM. 23 February 2017. Retrieved 8 March 2017. ↑ Davis, Noah. "Young, Digital, and Hungry: Inside the Companies of the Inc. 5000 Europe". Inc.com. Retrieved 8 March 2017. ↑ "Read About the Companies in the Inaugural Inc. 5000 Europe". Inc.com. 24 February 2015. Retrieved 8 March 2017. ↑ "Avicii – Hello world, Thank you for letting me fulfil so..." Facebook. 29 March 2016. Retrieved 8 March 2017. ↑ "Avicii Planning To Release New Album After Retiring". DJMag.com. 7 April 2016. Retrieved 8 March 2017. ↑ "Avicii, Otto Knows New Releases: Back Where I Belong (feat. Avicii) on Beatport". Beatport.com. 3 June 2016. Retrieved 8 March 2017. ↑ "Avicii Debuts Brand New Single, "Feeling Good (Avicii by Avicii)"". Your EDM. 23 February 2017. Retrieved 8 March 2017. ↑ "Avicii Officially Retires From Touring". Billboard. 28 August 2016. Retrieved 8 March 2017. ↑ Medved, Matt (22 December 2016). "Avicii & Longtime Manager Ash Pournouri Part Ways". Billboard. Retrieved 8 March 2017. ↑ Wass, Mike (28 June 2017). "Rita Ora Debuts New Song "Lonely Together" At A Private Event". Idolator. Retrieved 9 August 2017. ↑ Rishty, David (3 August 2017). "Avicii Reveals New 'Avīci' EP & Release Date, Teases More Music". Billboard. Retrieved 9 August 2017. ↑ McCallum, Rob (3 August 2017). "Avicii teases more new music ahead of forthcoming release". DJ Mag. Retrieved 9 August 2017. ↑ Rishty, David (7 August 2017). "Avicii Shares 'Avīci' EP Track List, Feat. Rita Ora, AlunaGeorge & More". Billboard. Retrieved 9 August 2017. ↑ Staples, Derek (9 August 2017). "Avicii shares 'Avīci' EP tracklist, feat. Rita Ora, AlunaGeorge, more". DJ Mag. Retrieved 9 August 2017. ↑ Erik (7 August 2017). "Avicii Returns To His Roots In Teaser For New Collaboration With Billy Raffoul". EDM Sauce. Retrieved 9 August 2017. ↑ "Avicii chats to Pete, Paul Oakenfold and DJ Alfredo recorded in Ibiza, Pete Tong". BBC Radio 1. ↑ Bein, Kat (11 September 2017). "Avicii Offers A Rare Look Into His 'True Stories' With Documentary Trailer: Watch". Billboard. Retrieved 21 April 2018. ↑ Nöje (21 May 2018). "Sources: New Avicii album will be released". Aftonbladet (in Swedish). Retrieved 9 July 2018. ↑ Iasimone, Ashley (21 April 2018). "Avicii's Unreleased Album Was His 'Best Music in Years,' Says Geffen Exec". Billboard. Retrieved 9 July 2018. ↑ "Avicii's Single "Heaven" With Chris Martin Is Being Prepared For Release". 5 August 2018. ↑ "Avicii's Track 'Heaven' With Chris Martin Is Set To Be Released After The DJ's Death". ↑ Did you know Avicii named Daft Punk, Swedish House Mafia and Eric Prydz as key musical influences?| Picture Galleries. Capital FM. Retrieved 29 March 2014. ↑ Weiner, Jonah. "Daft Punk: All Hail Our Robot Overlords". Rolling Stone. 1 2 Blacklow, Jeremy (21 April 2018). "Remembering Avicii, the Pop Innovator Who Led EDM Into the Mainstream". Variety. ↑ Greenburg, Zack O'Malley (14 August 2013). "Avicii And The Ever-Changing Definition of EDM". Forbes. Retrieved 21 April 2018. ↑ Bain, Katie (21 April 2018). "Avicii: the poster boy for EDM who struggled with the spotlight". The Observer. Retrieved 21 April 2018. ↑ Marzovilla, Julia (20 April 2018). "Avicii's Death Mourned by Calvin Harris, Marshmello, deadmau5 & More". Billboard. Retrieved 22 April 2018. ↑ "FEED". FEED Foundation. Retrieved 12 November 2015. ↑ Amorosi, A.D. (14 February 2013). "Avicci: Leading By Example With Charity". DJZ.com. Archived from the original on 8 April 2013. ↑ Youngs, Ian (20 April 2018). "Avicii: The superstar DJ behind some of the decade's biggest hits". BBC News. Retrieved 21 April 2018. ↑ Bein, Kat. "Avicii's Health Struggles: A Timeline". Billboard. Retrieved 22 April 2018. ↑ Nevins, Jake (20 April 2018). "Avicii: chart-topping EDM star dies aged 28". The Guardian. Retrieved 20 April 2018. 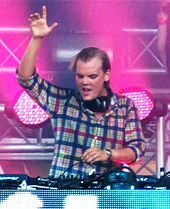 In 2016, Avicii retired from live performing due to health reasons, having suffered from acute pancreatitis owing, in part, to excessive drinking. In 2014, his gallbladder and appendix had been removed. ↑ Stack, Liam (20 April 2018). "Avicii, Electronic Dance Music Producer and D.J., Is Dead at 28". The New York Times. Retrieved 20 April 2018. But Avicii retired from international touring in 2016 at age 26 after a series of health scares that struck while he was on the road. He had his gallbladder and appendix removed in 2014. Before that, at 21, he learned he had acute pancreatitis, which he said was related in part to excessive drinking. ↑ Halperin, Shirley (11 September 2017). "'Avicii: True Stories' Documentary Reveals Star DJ's Struggles With Health, Fame and Early Retirement (EXCLUSIVE)". Variety. Retrieved 24 April 2018. ↑ Vultaggio, Maria (20 April 2018). "What is pancreatitis? Why Avicii stopped performing in 2016". Newsweek. Retrieved 20 April 2018. Swedish DJ Avicii died Friday in Oman, a statement from his rep told Billboard. He was 28 years old. A cause of death was not immediately known, but the DJ previously suffered from pancreatitis. ↑ "Avicii är död". Dagens Nyheter (in Swedish). 20 April 2018. Retrieved 20 April 2018. ↑ Nyren, Erin (21 April 2018). "Police Say 'No Criminal Suspicion' in Avicii's Death (Report)". Variety. Retrieved 22 April 2018. ↑ "Avicii's family reveals 'he could not go on any longer' in new statement". The Independent. 26 April 2018. Retrieved 26 April 2018. ↑ "Avicii's cause of death revealed: Report". Consequence of Sound. 1 May 2018. Retrieved 1 May 2018. ↑ "Avicii's tragic cause of death revealed after devastated family say DJ took his own life". Daily Mirror. 1 May 2018. Retrieved 1 May 2018. ↑ "Avicii cause of death reported as 'blood loss' as family confirm DJ died by suicide". 1 May 2018. ↑ Kaplan, Ilana (22 May 2018). "Avicii's family announce funeral plans saying it will host only 'the people who were closest to him'". The Independent. Retrieved 31 May 2018. ↑ "Swedish DJ Avicii buried in private funeral". The Straits Times. 14 June 2018. Retrieved 14 June 2018. ↑ "Awards 2018: Chainsmokers and Halsey Honor Avicii At BMAs". Variety Magazine. 20 May 2018. Retrieved 20 November 2018. ↑ "Watch The Chainsmokers & Halsey Pay Tribute To Avicii at the 2018 BMAs". Billboard. 20 May 2018. Retrieved 20 November 2018. ↑ Savage, Mark (27 May 2018). "Biggest Weekend: Rita Ora's Avicii tribute". BBC News. Retrieved 30 May 2018. ↑ "Rita Ora pays emotional tribute to Avicii at BBC's Biggest Weekend – NME". NME. 27 May 2018. Retrieved 30 May 2018. ↑ "WATCH: Rita Ora Pays Emotional Tribute To Avicii". ↑ "As a tribute to Avicii, One Republic performs Wake Me Up in Mumbai during their maiden concert - Hollywood News". ↑ "Relive Tiësto's Emotional Avicii Tribute Set In Full From EDC 2018 [VIDEO]". 21 May 2018. ↑ CNN, Theresa Waldrop,. "DJ Kygo calls Avicii 'a true musical genius' in emotional Coachella tribute". 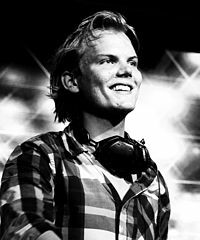 ↑ "Avicii Remembered by Axwell & Ingrosso, Hardwell and More at Tomorrowland 2018". www.billboard.com. ↑ "Multiple Avicii tributes at Tomorrowland honour the late EDM star". 23 July 2018. ↑ "ARTY Honors Avicii's Legacy & Generosity With Uplifting Melody On 'Tim': Exclusive". ↑ Ritschel, Chelsea (20 April 2018). "Avicii dead: Fellow musicians post tributes to the late DJ". Independent.co.uk. The Independent. Retrieved 12 June 2018. ↑ "Avicii's father honours DJ's life and legacy at emotional memorial attended by hundreds of fans". 17 November 2018. ↑ Bein, Kat (11 September 2017). "Avicii Offers A Rare Look Into His 'True Stories' With Documentary Trailer: Watch". Billboard. Retrieved 10 November 2017. ↑ Rebecka Ljung (6 November 2014). "First Aid Kit och Avicii på frimärke" (in Swedish). Sveriges Radio. Retrieved 24 April 2018. ↑ "Mike Posner – I Took A Pill In Ibiza Lyrics | Genius Lyrics". Genius.com. Retrieved 8 March 2017. 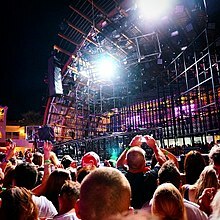 Wikimedia Commons has media related to Avicii.